Lior Lev Sercarz’s world view in a jar. Ask Lior Lev Sercarz, Manhattan’s maestro of spice blends, what No. 36 is best used for, and you will receive two things in return: his handsome Cheshire cat grin and what may at first seem like a complete and total non-answer. “I leave it up to you to decide what to do,” he says, cloaked in his navy blue cotton work smock that makes him look more like a physician or super-high-end hairstylist than the one-man mastermind behind the city’s most sought-after spice blends. That’s, um, a lot of different things, isn’t it? But Sercarz isn’t trying to be evasive or coy; he just doesn’t want you to judge before you taste; he wants to open the pantry doors for your palate and bring the entire world of flavor to your plate in a pinch — or a sprinkle or a toss or a dusting. Like an abstract artist who doesn’t want to tell you what his painting means, Sercarz wants you to paint your dish with spice as you see fit. He’s right. One night when my husband was out for a work dinner and I was home staring at near-bare cupboards and utterly uninspired, I decided to do the bachelorette baked-sweet-potato-in-the-microwave thing. As I cut into it and released its steamy, starchy sweet smell, I spied the jar of No. 36 on my counter — one of several I’d carried home after meeting Sercarz in his tidy shop. A generous sprinkling of Miss Ana (named, as it turns out for chef Ana Sortun of the Arabic-influenced Oleana in Cambridge, Massachusetts), and my tuber supper snapped to life, inspiring a great dinner-party side. If you walk into La Boîte Biscuits and Spices, his Hell’s Kitchen workspace and storefront, on a day between art installations, the place looks pretty spare. It could be an architect agency or an art gallery or a graphic designer’s lair with its clean, simple, almost modernly monastic appearance. But despite the white walls and white tile and wood floors, La Boîte offers the world at your pinching fingertips — ground, chopped, toasted, blended and set out in colorfully labeled jars that look like a makeup display at Sephora. 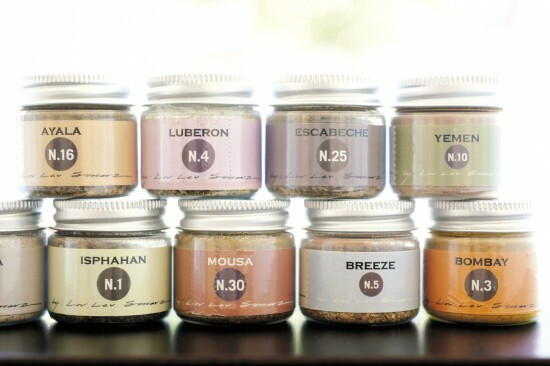 Even before you taste them or so much as pop open a jar, the aroma alone at La Boîte tells you this is no ordinary shop. That along with the words painted on the picture window looking out on 11th Avenue: Pure Real Taste. Close your eyes, breathe deeply, and exciting lands appear before your eyes: tented markets in Morocco piled high with crushed, powdery piles of red, gold and green; a field of fennel in France, green fronds waving a fragrant greeting in the breeze; a hint of pure cocoa from a baker’s box of tricks; a blast of curry leaf and cumin from a Mumbai kitchen or a London larder. 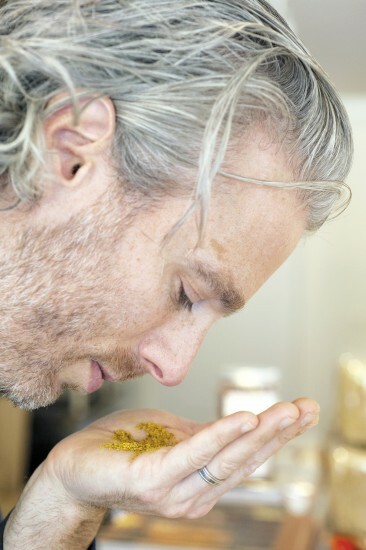 It’s these exotic, transporting scents and flavors that have made Sercarz, 41, the sought-after spice man of chefs like Laurent Tourondel (his first customer in 2006), Daniel Boulud and Dan Barber, as well as cocktail craftsmen like PDT’s Jim Meehan, who’s worked with Sercarz on their mutual obsession to come up with a better Bloody Mary. 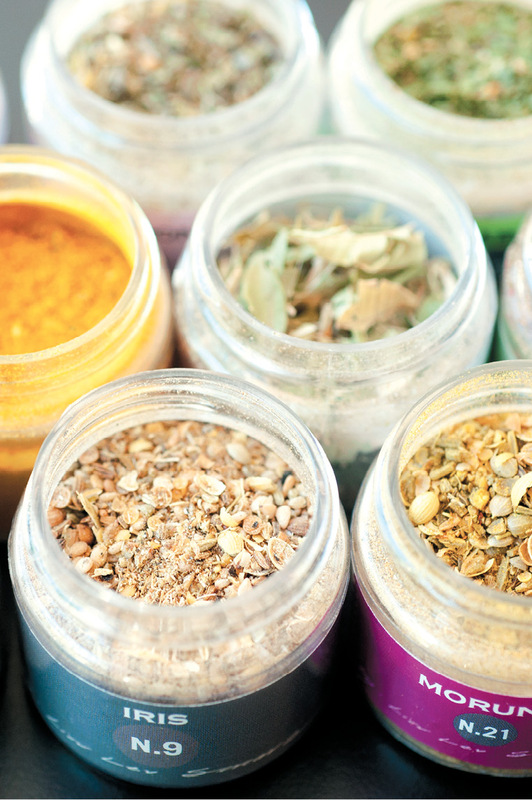 With such pedigree comes a price tag: A 2-plus-ounce jar of Sercarz’s spices are three times the price of your similar-size, workaday McCormick at Pathmark — but comparing the two is the equivalent of discussing the merits of acrylic v. cashmere. 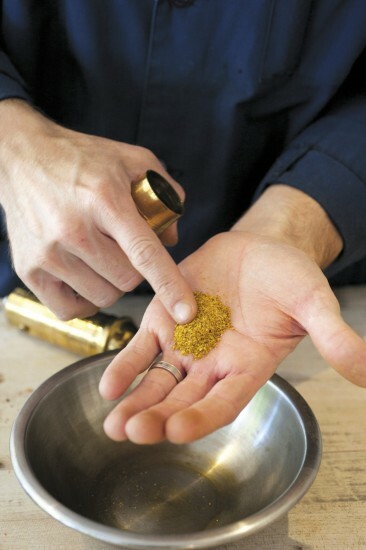 He makes 80 spice blends — 40 for purchase at his Hell’s Kitchen shop; 40 for private clients like Tourondel and Boulud. 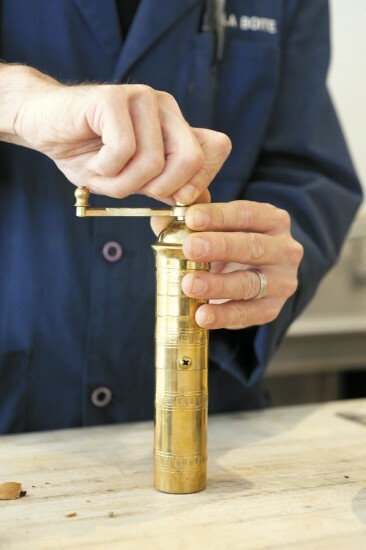 He makes them all by hand himself — considering, planning, sourcing, grinding, toasting — daily. But while he’ll offer one-word suggestions on the brightly colored labels of mixes like Marrakesh (cumin, cinnamon and thyme) and Galil (verbena, white cardamom, sage) of what to use with a particular blend, be it a fish or fowl or vegetable, he doesn’t like to put Baby Spice in a corner. “I’m a cook, first and foremost,” he says, a thick tussle of (fittingly) more-salt-than-pepper-colored hair falling around his boyish, narrow face. 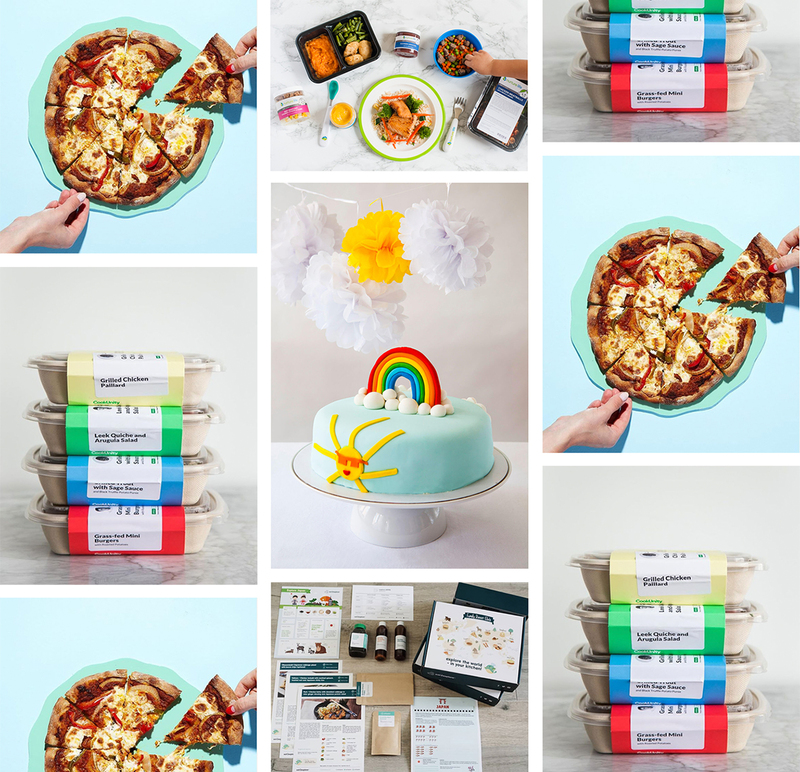 “When I manage, I’m a chef. In France, the word chef simply means ‘manager’ — you can be the chef of a gas station.” But Sercarz’s experience did indeed come from being a chef in the kitchen. Sercarz was born in Israel on a small kibbutz near Galilee to a family that bore no particularly consuming culinary traditions. “I don’t have that grandma story,” he laughs, “I didn’t learn that way.” Before he was out of Buster Browns, his parents moved him and his sister to Italy and then to Belgium, where a new world of food traditions spilled onto his plate. When he came of age, he served his required military term with the Israeli army as a sergeant on KP duty. Better he would become. Post-army, he decided to get a job with a catering outfit in Israel. After the buttoned-down army stint, Sercarz grew his hair long, got an earring and, he says, walked around barefoot for a few years, relishing a new freedom of expression that also found its way into his food. After three years, though, he knew he needed more of it. 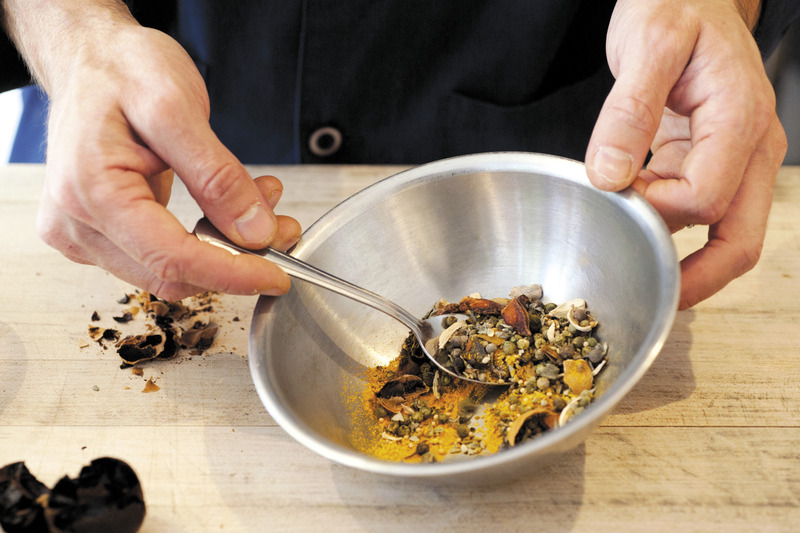 In the mid-’90s, he left for Lyon, France, to train for two years at the Paul Bocuse Institute, and from there he traveled to Cancale, Brittany, to work with spice-centric chef Oliver Roellinger. But echoing Sercarz’s own words: You can’t teach someone to love cooking, but if they do, you can teach them to cook better. His own innate, keen sense of taste and smell and intense curiosity for cultures and collaborations fed a passion for flavor that, after eight months in Cancale (an influence that slyly shows up in an eponymous spice mix as well as one of the few chocolate bars he also makes at La Boîte, spiked with fleur de sel, orange and fennel), brought him to the United States in 2002 to the kitchen of Lyon native Daniel Boulud, who quickly recognized Sercarz’s talent for taste. 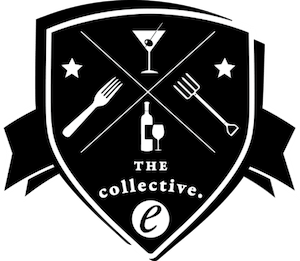 It was here, too, he also began his first think-outside-the-kitchen collaborations with then head bartender Xavier Herit, who would tap Sercarz for spice-spiked cocktail inspiration. What he slowly came to realize in a decade-plus of working in kitchens from Israel to the Upper East Side was that, perhaps, it wasn’t his own restaurant that was the final goal—but something a bit spicier. After four years, he gave Boulud his notice and did a little catering work to earn his keep. His first project was making cookies—or biscuits, as he prefers to call the demure, buttery, savory bits he still bakes and sells at La Boîte — a never-to-be-repeated seasonal mix of five different cookies. They tease the tongue with chilies, saffron, poppy seeds, curry, myriad citrus and coconut. It was this clever think-outside-the-tin trajectory that led chef Laurent Tourondel to seek out Sercarz and ask him to make a few spice blends for his then eatery, BLT. But that proved problematic, too. Eventually, through trips back home to Israel and relationships he built at the markets there and via his dogged research back home in New York, he found sources and began to build his blending business. Today, he works with about 15 spice purveyors (“I’m only as good as my worst supplier.”) And now that he’s built a reputation, sometimes he is even approached by small growers, like the Cambodian pepper farmer who sought out Sercarz to sell him her wares, farmed without machines because tractors can’t make it up and down the steep lands where they grow. Seven years later, he employs four people to help him bake the biscuits, wrap and package his product. His wife, Lisa, created the beautiful multicolored packaging on both the jars and biscuits. The latter are changed on a spring/summer and fall/winter basis and feature the work of an artist on a card, tucked into the tin box with the cookies. When the cookies are released for the season, the walls are hung with the artist’s work and stay there for the six-month period the cookies are out. 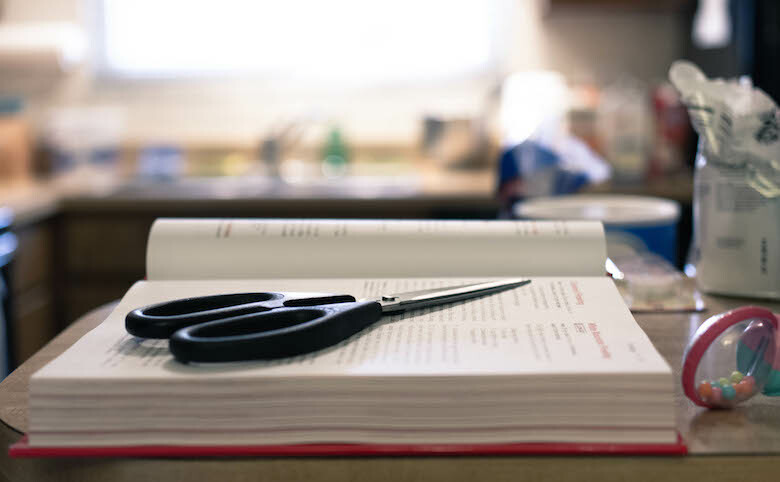 Sercarz has found himself in the position of gentle teacher, quite literally, having given classes at Havens Kitchen, I.C.E. and the International Culinary Center. But the lessons also happen within La Boîte, too. 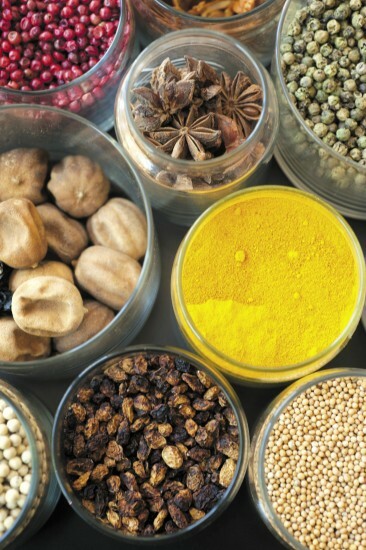 It’s not just chefs who call or come in for a pinch of global flavor, but the curious cook and, often, non-cook, many feeding into one of Sercarz’s favorite proclamations of challenge: “I don’t like spicy things.” This, he says, is lesson one — discerning the difference between spice and heat. And then there are the collaborations with people like Meehan, whose head bartender at PDT, Jeff Bell, found Sercarz while looking for cocktail inspiration. “We hit it off—[it’s] kind of hard to not love him — and I began to think about how we could work together more closely,” says Meehan. 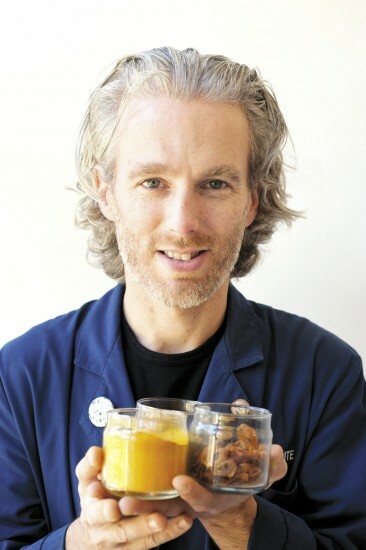 “Up until our Bloody Mary project, all of the spices we acquired from La Boîte were incorporated into aromatic spice rims.” Besides sugar and salt on occasion, he says, very few dry spices are used in cocktails, with the one popular exception being the Bloody Mary. Sercarz liked the proposition. He, like Meehan, wasn’t a big fan of versions he’d had in the past. Together, he and Meehan talked about different spirits and their individual qualities, and from there created four different blends for use with different spirits combined with tomato juice. 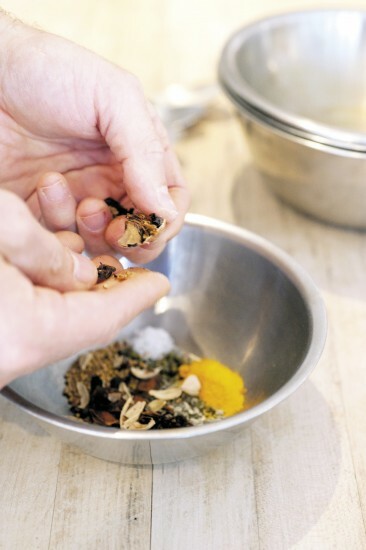 Dan Barber is urging him to work with local herbs and roots for a New York–centric addition to his line of spices (“It’s possible with some things that grow here, like coriander and fennel,” Sercarz muses), but for now he remains a happy guest at a world party of flavor. 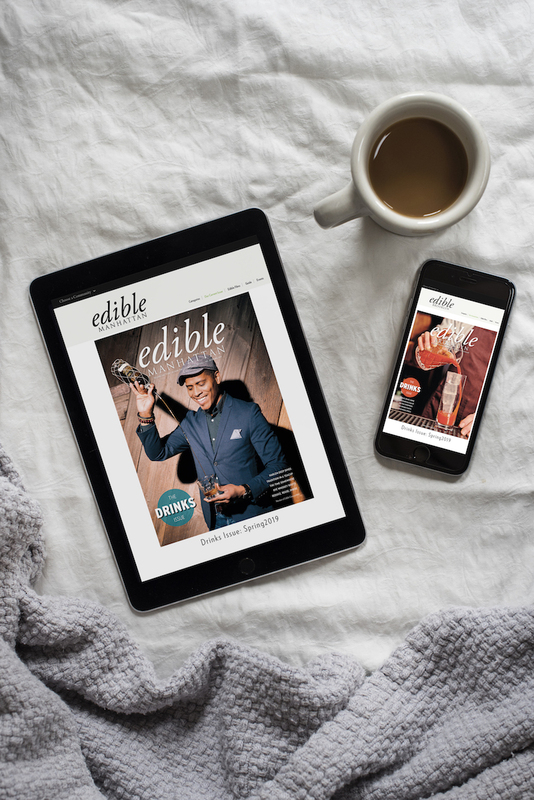 Amy Zavatto is deputy editor of Edible Manhattan. Her favorite Spice Girl is Scary, but she also fancies Posh.